Send me exclusive offers and promotions. View DisclaimerBy submitting your email address or phone number, you allow us, Kingston Acura, to include you on our contact lists to send you information about our products, services and promotions. You may revoke consent at any time by clicking on the "Unsubscribe" link in your email. Disclaimer: †Limited time lease offer based on a new 2019 TLX Base (UB1F3KJ) // model shown, a 2019 TLX SH-AWD® Elite A-SPEC (UB3F8KKN) available through Acura Financial Services on approved credit. Representative lease example: 0.9% // 0.9% (1.77% effective APR) lease rate for 36 months (78 payments). Bi-weekly payment is $188 // $270 with $3,350 // $3,350 down payment. 16,000 km allowance/year; charge of $0.15/km for excess kilometres. Total lease obligation is $18,014 // $24,410. Lease payment includes freight and PDI of $2,045 and applicable fees but does not include lien registration fee up to $70.75 and lien registering agent fee of $5.00, which are due at time of delivery. Taxes, insurance, licence and registration fees (all of which may vary by region) are extra. 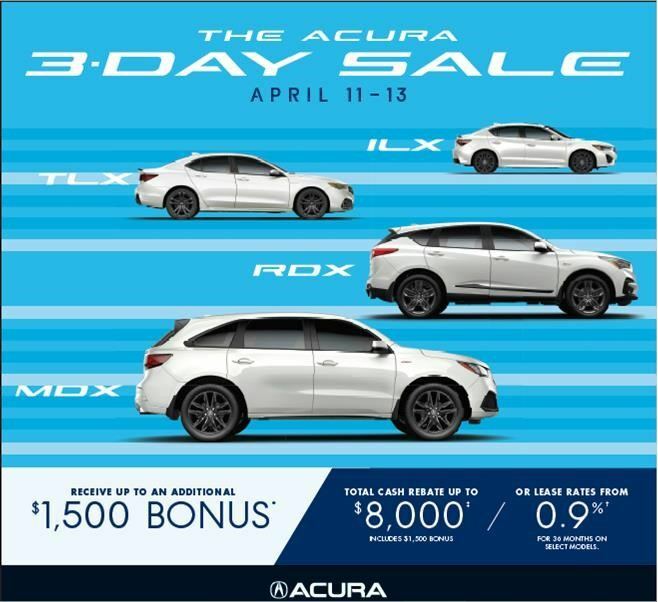 ‡$2,000 cash rebate available only on the cash purchase of new and previously unregistered 2019 Acura TLX Tech (UB1F5KKN), TLX Tech A-SPEC (UB1F6KKN), TLX SH-AWD® Tech (UB3F5KKN), TLX SH-AWD® Tech A-SPEC (UB3F6KKN), TLX SH-AWD® Elite (UB3F8KKNX), and TLX SH-AWD® Elite A-SPEC (UB3F8KKN) models from an authorized Acura dealer when registered and delivered before September 30, 2018. Total incentives consist of: (i) $1,000 that cannot be combined with lease/finance offers; and (ii) $1,000 that can be combined with lease/finance offers. All incentives will be deducted from the negotiated selling price after taxes. Some terms/conditions apply. Model shown for illustration purposes only. Offers end September 30, 2018 and are subject to change or cancellation without notice. Dealer may sell/lease for less. Dealer order/trade may be necessary. While quantities last. Certain features only available on certain trims. Visit acura.ca or your Acura dealer for details. © 2018 Acura, a division of Honda Canada Inc.